To echo what Root says in one of the best scenes of the season: This is really nice. That scene, where Finch and Root work side by side, is one of many recent sequences that serve as testaments to how rich the relationship between these two has become. This pair’s particular similarities and differences make for a great, complex character dynamic. On paper, their pairing would come across as being potentially cartoonish. This Odd Couple consists of tech nerds who are basically two peas in a pod—but wait, he’s a recovering creator turned skeptic while she’s a recovering psychopath turned disciple. Will Finch and Root allow the Machine to come between them or will they learn to live and love in this wild and wooly world of ours? Cue theme music. 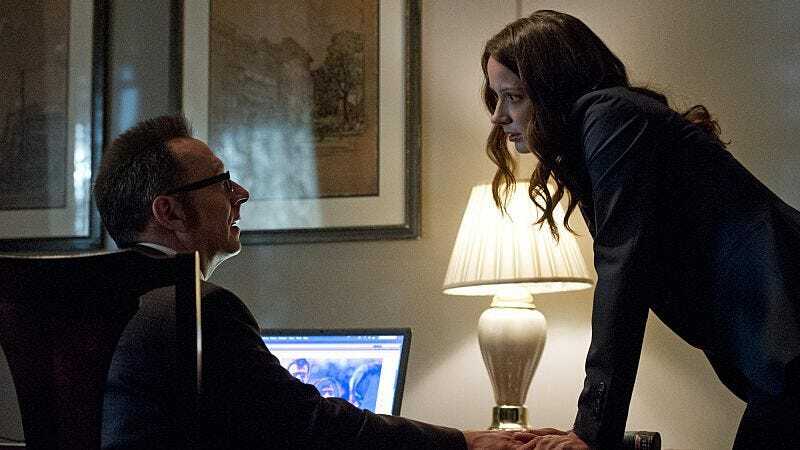 Thankfully, Person Of Interest has realized the potential in these two, mining their dynamic to the point where it could stand in as the show’s multi-part thesis statement. Their debates and common ground cover the bulk of the show’s interests. Both fill the holes in their lives created by chaos and loss with technology. Finch no longer has Grace and Root is a nomad, assuming identity after identity, but they both have the Machine. Their parallel relationships with a computer are illustrated by every scene in which Finch’s face fills the screen as he communicates with the Machine and Root follows every direction given through her earpiece. These distinct relationships recall an episode of Halt And Catch Fire that depicts the public’s initial embrace of Apple products, which was partly due to the ability to interact directly with computers that had been given voices. In one another, Finch and Root have found kindred spirits who have experienced and craved the same things, namely the control and predictability that technology can offer human beings who often feel powerless. Power complicates everything, and this pair’s individual bonds with the Machine, and with one another, comment on this phenomenon. References to topics as diverse as religion, humankind’s relationship with technology, and the dynamics between a parent and child demonstrate the level of thought that the writers have put into the show’s premise and the roles that Finch and Root play. Person Of Interest’s characters transcend their roles because they’re alternately mission-obsessed soldiers and caretakers imbued with humanity; unlike computers, they feel. Between Claire, Root, and Martine, we’ve seen a spectrum of operatives involved with artificial intelligence. Root was on the road to becoming a robotic minion like Martine; Claire may be well on her way down that path. The team’s humanity may have influenced Root in the same way that Finch influenced the Machine, encouraging it to become a more good-natured force than Samaritan. When Finch expresses doubt in his mission, it’s usually based on concern for others. The team’s warmth has begun to melt Root’s hard exterior; her feelings for Shaw apparently can’t be denied, for one! Caring is one of humanity’s greatest weaknesses, but also one of its greatest strengths. Finch challenges Root, wondering if her loyalty to the Machine is worthwhile if this artificial intelligence—a computer similar to Samaritan—doesn’t care about society. Caring is what separates us from the machines. The number of the week, Simon the pollster, may be a machine when it comes to predicting election results, but he still cowers in fear and breaks down emotionally when Samaritan jeopardizes his career, his self-esteem, and his life. Caring too much can be a liability. Power is attractive, but wielding it or witnessing its wrath can devastate a person over time. Adding therapy sessions to reveal a character’s inner thoughts can be a writing crutch, but the exploration of Reese’s grief and possible PTSD due to his line of work and Detective Carter’s death prove effective. Reese’s harsh treatment of the potential jumper in the opening, as well as his manipulative and destructive tendencies, could be considered coping mechanisms for the purposes of numbing pain; pain being an inevitable side effect of choosing a violent profession. Whether obeying rules or breaking them, Reese has been both leader and follower; given his experiences, both roles are taking their toll. Due to their humanity, people are less predictable than Samaritan anticipates, to the despair of professionals like psychologists, sociologists, and economists, whose jobs would be much easier if this weren’t the case. Samaritan has rigged 58 elections nationwide in an effort to gain control over society, forgetting that this requires depending on people and, as a species, humans aren’t particularly dependable. Samaritan’s plans are manifesting themselves more and more concretely and, in this case, the mystery and the reveals have been equally compelling. More Dominic and Elias would be welcome, but this is the most excited I’ve been about an election-related arc in a long time, and that’s saying something considering how prevalent they are on television. Sorry, The Good Wife. Every great show has to settle for runner-up once in a while. So, Root, this message you’d like to leave for Shaw in case of your demise. Go on… I’m not being a creeper; I genuinely want to know what’s going on here. Scenes of Amy Acker assuming different identities—and disrobing—bring to mind one of my favorite shows, the sadly underrated Dollhouse. (It’s a Secret Success, for the record.) A piece about the shows’ respective takes on the merits and drawbacks of technology, which thankfully avoid hysterical handwringing (Men, Women, And Children, I’m looking at you), is taking shape in my mind as I’m writing this. My love for this episode is partly due to the excellent execution when it comes to both performance and direction. Again, a great actor usually means a great number of the week, and it may be my general admiration for Jason Ritter speaking, but I thought that he made Simon’s plight very compelling in the little time he had. I have too many favorites to list, but the wide shot of Root and Martine shooting at one another through the floor, one above and one below, was exquisite. 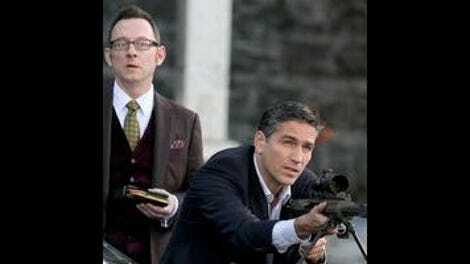 The fact that one episode can deliver great character work, philosophy, and action demonstrates the high level that Person Of Interest is capable of achieving.